20160305 + up and all to G's basketball game. Gma&paB were there, it was an intense game, with some shady coaching from the other team... G was upset, basketball is over. LJ&G went out to lunch with Gma&paB and then shopping. D, GF4 (I think we are up to 4...) and I headed to Lowe's to see Tom and get some more supplies, then on to the house to get some things done. looks really good and about at the end of the spectrum of what I have time to do... LJ&G showed up and we worked for a bit more. 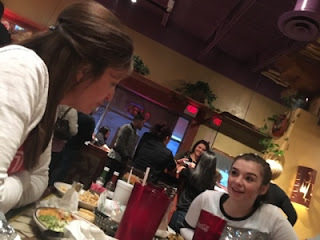 Home, cleaned up and we all, including GF4 went to the Mexican place for a nice dinner. Home and we watched some TV before bed.